Do you remember when your mom used to tell you to eat your fruits and vegetables? Or perhaps she packed healthy school lunches for you, or encouraged you to stay physically active—preferably with an exercise that didn’t involve turning on the TV! You probably didn’t see it at the time, but everything “mom” did was to help you grow into a strong, healthy adult. With Mother’s Day almost here—why not forgo the traditional chocolates in favor of some healthy, fun alternatives? 1. Cook a healthy brunch: Instead of taking mom out for dinner, why not prepare a healthy meal for her? May I suggest creating a delicious kale frittata? It is a delicious, easy-to-prepare egg dish that is loaded with antioxidants from vegetables. Prepare with egg whites, a pinch of Gruyere or Parmesan cheese, and then throw in some kale, tomatoes and spinach. Add salt and pepper for flavor. Make sure to complement the main dish with a healthy salad and a bowl of juicy strawberries. Throw in some whole-wheat toast, freshly squeezed juice…and voila! You have created a, healthy, delicious Mother’s Day brunch. 2. Set up a “healthy” appointment: The Centers for Disease Control and Prevention says that Mother’s Day is a good time to remember to schedule necessary checkups for your mom. Some examples include: breast cancer screenings, pap tests and osteoporosis screenings. You can even go that extra mile and set your mom up with a nutritionist! One word of advice: Set up the necessary appointment in addition to making your mom brunch. 3. Spa day: After a long day at work, taking care of the family, and/or running errands, your mom will appreciate a chance to get pampered at a spa. A massage, facial and manicure will help your mom feel better about her outward appearance, and provide her with physical and mental stress relief. 4. Picnic: The sun is out, and the weather is warm—why not spend Mother’s Day afternoon outside? 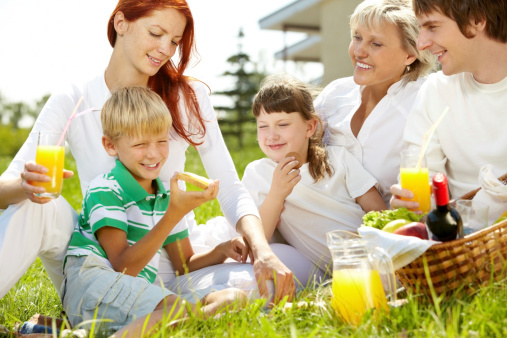 Prepare a healthy lunch for mom and serve it in your backyard or at the park. 5. Dark chocolate: Forget the sugary-sweet chocolate; buy your mother some dark chocolate. Dark chocolate contains anti-inflammatory antioxidants, and they are filled with a healthy type of flavonoid called flavanols. They work well for the heart and also have other vascular benefits, including lowering blood pressure, improving body flow to the brain and heart, and making blood platelets less sticky so they are less likely to clot. 6. Non-toxic candles: Paraffin wax scented candles can unfortunately release dangerous toxins into the air, resulting in air pollution inside the home. If your mom loves scented candles, then I’d suggest giving her the gift of non-toxic candles, crafted with organic coconut butter wax and essential oils. 7. Homemade chicken soup: This brings back memories. Do you remember when you were sick, and your mother would prepare a delicious, homemade soup to help nurse you back to health? It’s time to thank her by preparing her a delicious, healthy, homemade soup—filled with delicious carrots, onions, sage and parsley. Put the soup in a jar and wrap a bow around it. Attach a ‘Thank You’ card to the jar. In the card, let her know that you appreciate all of those times she took care of you when you were sick. 8. Sandals: If your mom loves to walk, then purchase her a nice, comfortable pair of sandals or walking shoes. It might seem like a simple gift, but she’ll think of you every time she wears the shoes to take a walk around the block. 9. Ice Cream:If your mom loves sweets, then why not buy her some tasty, organic ice cream? Make sure it includes organic fruit (strawberry and blueberry are popular flavors). 10. A Bike: Some people think that the easiest solution to exercising and staying healthy is going to the gym. But your mom may not have time to visit the gym on a consistent basis! Get her a bike—she can use it anytime she wants to get some exercise and fresh air. As an added bonus—she’ll feel like a kid again. We love our mothers—so don’t get lazy, or cheap, when it comes to getting her the perfect, creative gift this Mother’s Day! Of course, if none of the healthy gift ideas relate to you or your mother, just give her something from the heart. At the end of the day, she is your mother—she’s going to love whatever you get her. Oaklander, M., “15 Mother’s Day Gifts Your Mom Really Wants,” Prevention web site, April 19, 2013; http://www.prevention.com/health/healthy-living/15-mothers-day-gifts-your-mom-really-wants?slide=13. Bushak, L., “Mother’s Day Health: 5 Healthy Activities To Help You Celebrate Mother’s Day,” Medical Daily web site, May 10, 2014; http://www.medicaldaily.com/mothers-day-health-5-healthy-activities-help-you-celebrate-mothers-day-281662.